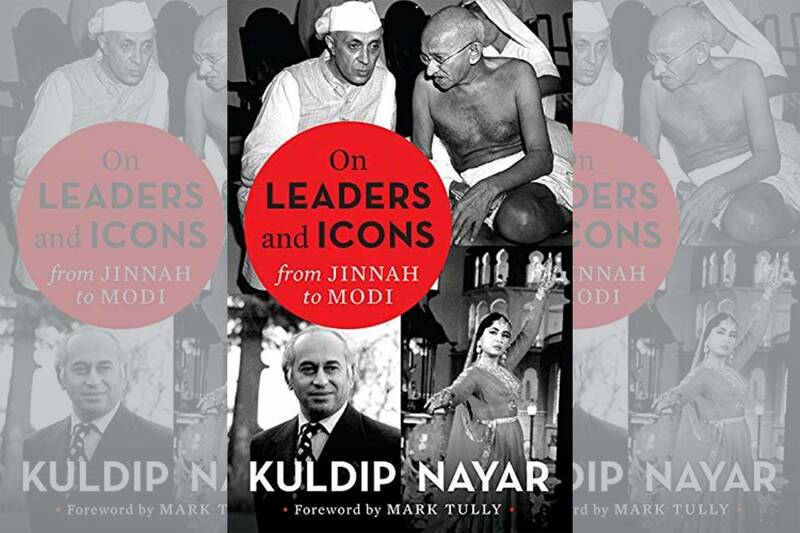 Legendary journalist Kuldip Nayar finished his book, On Leaders and Icons from Jinnah to Modi, barely a few weeks before he passed away last year. In his riveting last book, Nayar recounts his experiences of meeting and working with several leaders and icons shaping the destiny of pre and post-Independence India; he also recovers the truths and explodes the myths surrounding them. After migrating from Sialkot in Pakistan to Delhi, Kuldip Nayar was keen to see Mahatma Gandhi. So, he went to Birla House, venue of Gandhi’s daily afternoon prayers where passages from all the holy books, the Gita, the Bible and the Quran were read. According to the author, one day a Punjabi Hindu objected to the reading of Quran because he had reservations about the religion. It resulted in Gandhiji adjourning the regular prayer session for a week till such time he agreed to withdraw his earlier position of opposing Quranic recitation. Another Punjabi Hindu migratory from Pakistan threw a long knife at Gandhiji’s feet because his only son was killed by Muslims. In response to this, the Mahatma advised him to raise a 12-year old Muslim orphan in the best tradition of Islam to shame the bigoted. It’s therefore no wonder why even decades after his assassination, Mahatma Gandhi still has a powerful message for the world. Perhaps it’s only Khan Abdul Ghaffar Khan, a Congress Working Committee member, in Indian political history, who despite being offered presidency preferred to remain an ordinary party worker. Khan, popularly known as Badshah Khan as also Frontier Gandhi was close to Gandhiji and a staunch supporter of his non-violence. Founder of Khudai Khidmatgar (servants of God) movement, Badshah Khan strongly opposed the All India Muslim League’s demand for partition of India only to see the Indian National Congress later agreeing to the partition plan without even consulting the movement leaders. To this, he told Congress “You have thrown us to the wolves”. After Independence, Badshah Khan demanded autonomy for Pashtunistan as an independent state within Pakistan which remained his lifelong battle. Nayar felt Khan was so popular in India that he could have easily become President either before or after Rajendra Prasad. During his meeting with Khan, the author observed that Frontier Gandhi was never forgiving to Nehru as he failed to keep his promise that following India’s freedom, Pashtunistan would also become an independent country. The human rights activist, Nayar always remembered Lal Bahadur Shastri for his austere living and frugal needs. While serving as Shastri’s information officer, the then home minister, Shastri confided in Nayar that had the Pakistani troops fought by the side of Indian soldiers and driven out the Dragon during the India-China war in 1962, it would have been difficult to say “no” if Pakistan had asked for Kashmir. In his spellbinding book, Nayar wrote he first met Mohammed Ali Jinnah when he was in Law College in Lahore. Jinnah, who initially joined Indian National Congress in 1906 avoiding the Indian Muslim league, joined the later in 1913 following his rift with Gandhi. Jinnah however passed away in 1948, a year after Pakistan’s creation and Gandhi died a few months earlier. The exemplary diplomat, Nayar felt had both of them lived longer and led their countries for some more time, Indo-Pak relations might have been better. According to the author, Jawaharlal Nehru truly wanted Indira Gandhi to succeed him which he might have denied publicly and he was of the view Nehru’s thinking was on the lines of Mughal kings. Following Nayar’s exclusive report in UNI that immediately after Nehru’s death Morarji Desai was the first to throw his hat in the ring created widespread outrage which destroyed Morarji’s chance to succeed as the next Prime Minister. “Indira, you were beautiful before and now you look even more beautiful” was Nayar’s response to Indira Gandhi’s question how she looked following her hair shortening. Regarding Mrs Gandhi’s death, Kuldip Nayar mentioned that post-Golden Temple Operation she was warned by the Intelligence Bureau that two of her bodyguards be replaced, but Mrs Gandhi said “I have full faith in him” and eventually they were the killers. When Nayar met Zulfikar Ali Bhutto, the then Prime Minister of Pakistan and asked him whether the 1965 war was his doing, he didn’t deny and also assured him that he would never repeat what he had done and he had “learnt from history”. Nayar met Sheikh Mujibur Rahman several times and during one of the interviews he asked Mujib about the anti-India feeling which he encountered while visiting Dhaka Press Club. To this, Mujib said those pressmen were pro-Pakistanis who used to enjoy a regular stipend from Rawalpindi. At a function in Aligarh Muslim University, Kuldip Nayar found Farooq Abdullah, the speaker, fundamentalist in approach against which he complained to his father, Sheikh Abdulah, who was opposed to violence. Nayar wrote that Sheikh Abdulah was conscious of the fact that “the state had more guns than an individual or a political party could muster and it would be foolhardy to confront the government with weapons”. Jayaprakash Narayan’s movement was for cleansing and as Nayar wrote that though it was against Mrs. Gandhi’s autocratic and corrupt rule, JP raised the larger question of propriety and morality in public life. It was however a different story when Lalu Prasad who owed his political career to the JP Movement was power hungry, an antithesis of what JP stood for. Khushwant Singh, a renowned journalist and also bar-at-law from London, called as Professor Sahib by Nayar, taught him company law. Singh’s weekly column With Mallice Towards One and All was critical of militants of Punjab. However, during the anti-Sikh riots in 1984 he had to seek shelter in the Swiss embassy in Delhi to save himself from the wrath of Hindu extremists who were killing Sikhs with the connivance of police, Nayar wrote. Kuldip Nayar met Faiz Ahmad Faiz in Kremlin, Moscow, after Inder Malhotra, eminent journalist introduced him to other visiting Indian journalists as the greatest living poet. Leftist in ideology, Faiz was frugal in personal habits and living and didn’t believe in any religion. And, as he lived in Pakistan, he described Islam as Lal Islam or Red Islam. Kuldip Nayar ’s last book exquisitely demonstrates his distinctive ability to question the need for fiction when real life is so plump with drama and intrigue. Personal anecdotes about a number of leaders and icons make this book a rare treat for readers of modern Indian affairs. Between the lines.